Volexity has conducted the following research in collaboration with RiskIQ. We will discuss the same incident from different perspectives. RiskIQ’s report of this activity can be seen here. Magecart script utilized for the Newegg compromise. Create a variable named dati containing all information entered within a form titled checkout. Take the data captured within the dati variable and create an array by serializing the form field names and values with the serializeArray() method. Takes the array of data and convert it to a JSON formatted string with the JSON.stringify() method. Submit the JSON string to the URL https://neweggstats.com/GlobalData/ within a POST request. 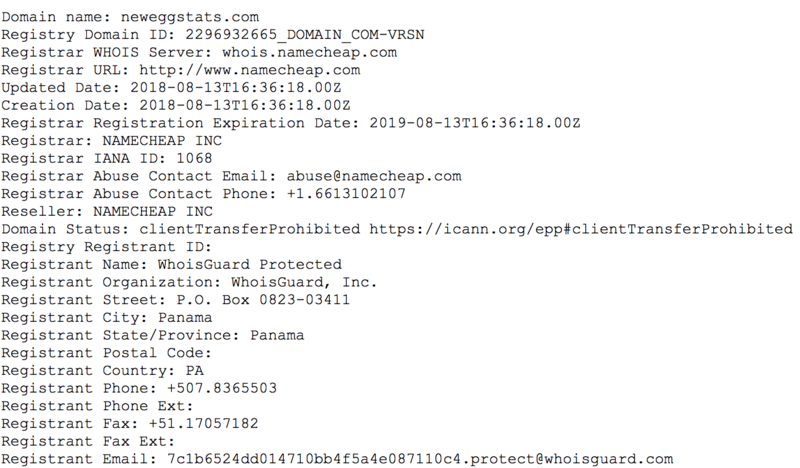 WHOIS information for the malicious domain neweggstats.com. 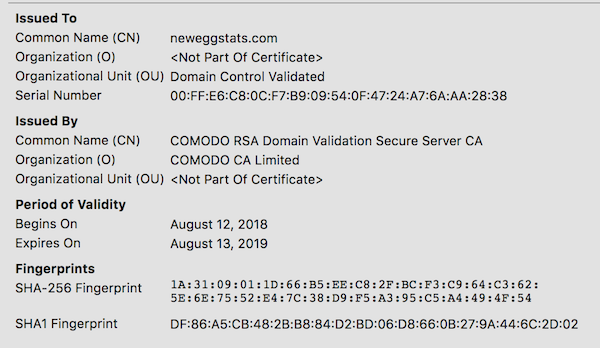 The Magecart attackers also created an SSL certificate for the website via Comodo, which was issued on August 13, 2018. More detail on this SSL certificate can be viewed via Censys here. SSL Certificate information for neweggstats.com. Through its global sensors network, Volexity was able to confirm attacks via Newegg three days later on August 16, 2018. Based on data that Volexity obtained from its sensor network, it appears the code may have been added somewhere between 15:45 and 20:20 UTC. 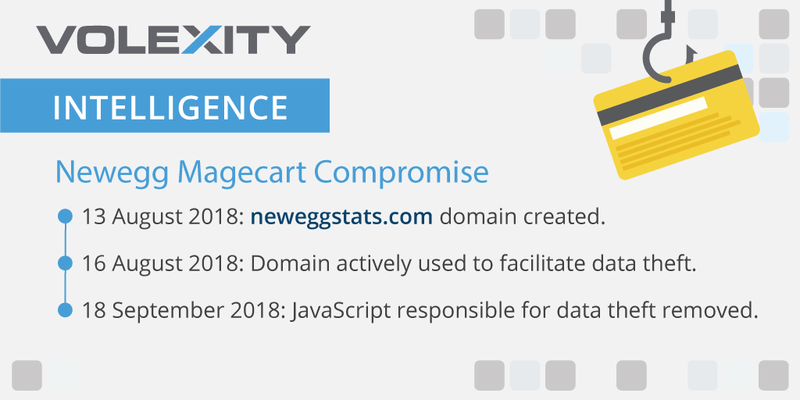 It is possible that the attackers started earlier, however, Volexity’s review of various networks with Newegg transactions earlier in the day and leading up to this time show no connections back to neweggstats.com. Finally, the malicious code was removed from the Newegg website on September 18, 2018. Volexity was able to confirm the code was no longer present during the checkout process and has not seen it return. neweggstats.com 217.23.4.11 Magecart domain utilized to receive data during the Newegg compromise. Stolen data is sent via a POST request to the URL path /GlobalData/.